[virgin trains] A new 125mph Pendolino train will enter service with Virgin Trains this summer, giving customers another boost as record numbers of passengers flock to the West Coast Mainline, the Department for Transport (DfT) and Virgin Trains have agreed. [swt] Tens of thousands of passengers who use Clapham Junction every day will benefit from better access, less congestion and improved facilities following the official opening today of the new entrance and nine new lifts at the station. [db] On behalf of the worldwide operating steel producer Tata Steel, DB Schenker Rail has set up a shuttle service connecting the company's steel works in IJmuiden, the Netherlands, with the works in Llanwern, Wales (UK). [network rail] A new poster campaign raising awareness of how to spot potential skin cancer has been launched by Network Rail, which has more than 15,000 employees who regularly work outdoors. [sncf] On May 30, 2011, Alstom's CEO Patrick Kron symbolically delivered to SNCF's President Guillaume Pepy the first 3rd generation Duplex TGV train set. It is the first double-deck interoperable very high speed train capable of traveling on all European rail networks. [eurostar] Eurostar, the high-speed passenger service between the UK and mainland Europe is offering direct weekly summer services to Avignon in the heart of Provence, from 9 July to 10 September 2011. [network rail] Network Rail has unveiled new plans to transform London Bridge, to create a bigger and better station for passengers and enable a more frequent and reliable train service to operate. [eurostar] Eurostar, the high-speed passenger service between the UK and mainland Europe has reported an 8% surge in outbound bookings for Easter bank holiday weekend, compared to the same Easter weekend last year. 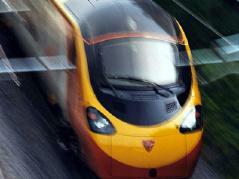 [virgin trains] Virgin Trains has been awarded two Kitemarks by the British Standards Institute. A first-ever for a UK company, the prestigious Kitemark stamp is one of the world's most recognised symbols of quality and was given to Virgin Trains for its tangible efforts to reduce energy consumption on trains. [network rail] Train operator c2c – which runs services between London and Essex – saw 97.4% of its trains arrive on time in March making it Britain's most punctual operator for the month.